was made from or where the scene is located. The drama of the fiery sky in this oil painting by Susan Woodhouse immediately provokes a feeling of anxiety in the viewer. This is further developed by the dynamic line of the sail of the boat which is the focal point of the painting, and the artist’s skilful use of the splashes of bright red used on the boat from an otherwise limited palette of cobalt and siennas. The eye is led to this main boat by the activity of the men on the left pushing the rowing boat towards it, thus uniting the shallow and the deep plane of the distant horizon where more dynamic lines of sails appear. Below the huge threatening sky of stormy billowing clouds, which covers two thirds of the picture, the boats and the pier loom in dramatic silhouette on a swirling sea where the free, brisk, lively energetic brushwork emphasises the storm in the scene. Susan Woodhouse, nee Shepherd, was born in Newton Heath, Manchester in late 1871 or early 1872. (2) Her father, Edward, was a manufacturing chemist. In 1898 she married William Henry Woodhouse, a pawnbroker from Ardwick. The couple were still living in Manchester at the time of the 1901 census but by 1907 she was listed as living at 107 Warton Street in Lytham, although her husband William was not included at that address. By the 1911 census she was still resident there with William and a live-in domestic servant. The census revealed that prior to 1911 the couple had had two children who died in infancy. Susan was widowed in 1918 at the age of 46. The probate record for William reveals that by then they were living at 20 Cyprus Avenue in Ansdell. She continued to live at Cyprus Avenue until she herself died, aged 77, on 24 October 1948. She appears to have had no living children. Susan Woodhouse also donated a large watercolour by Henry Rheam, Harbour Scene with Figures (1889). This picture remains in the Collection. 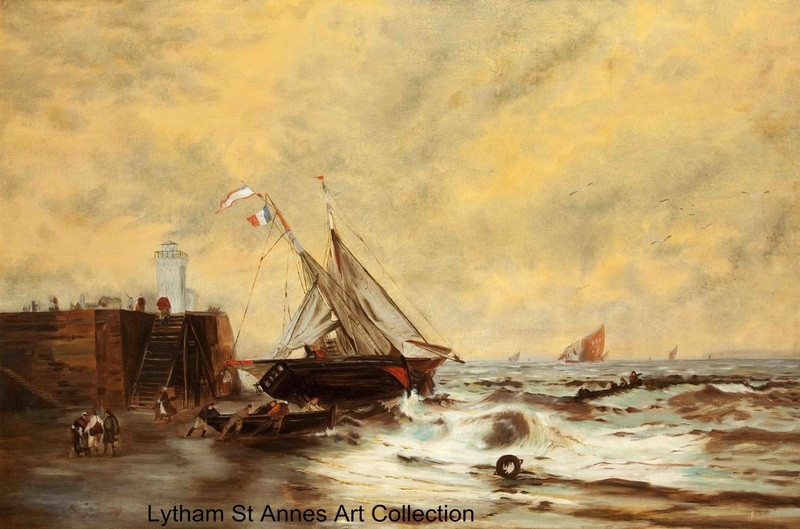 Rheam had links with the Newlyn School but Woodhouse, as Sartin noted, seems to have been an amateur artist who lived locally with no connection to Rheam or Newlyn.